Peppers and burpless cukes at the Wakefield Farmers market last year. The Wakefield Farmers Market opens for the season April 17. It’s in the parking lot at Wakefield Park, 8100 Braddock Road, Annandale, and will run every Wednesday, 2-6 p.m., through Oct. 30. The Wakefield market is one of 10 farmers markets operated by the Fairfax County Park Authority. The Annandale market, at Mason District Park, will open at 8 a.m. on May 2. Barajas Produce, Westmoreland County – seasonal fruits, vegetables, and herbs, including beets, broccoli, carrots, eggplant, kale, onions, peppers, raspberries, squash, swiss chard, strawberries, and much more. Elda Gardens, Fauquier County – Herbs, flowers, vegetables, beef, bee products, candles, etc. F.J. Medina & Son Farm, Westmoreland County – Many kinds of vegetables, herbs, and fruit. Kuhn Orchards, Adams County, Pa. – Apples, apricots, cherries, nectarines, other fruits, and vegetables. Luke & Son for Global Food, Loudoun County – Egyptian flatbread, falafel wraps, stuffed grape leaves, salads. Metropolitan Bakery, Washington, D.C. – Baked goods. Nitro’s Creamery, Fairfax County – Ice cream and kettle corn. Salsa Las Glorias, Fauquier County – Hot and mild salsas. Stallard Road Farm & Botanicals, Culpeper County – Beef, goat meat, eggs, blackberries, chestnuts, jams, mushrooms, honey, and herbs. Waterford Run Farm & Forge, Culpeper County – Granola, scones, and other baked goods; eggs; peppers; and more. Fairfax County Master Gardeners will hold plant clinics at the market, but their schedule has not been finalized. The Audrey Moore RECenter will host a booth once a month with information on health and wellness. 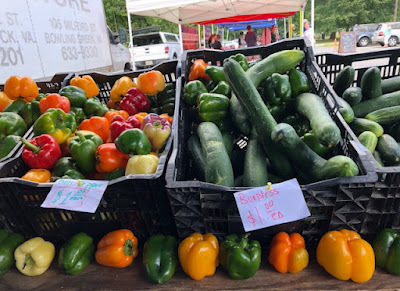 The Fairfax County Farmers Markets are strictly producer-only, meaning all farmers and producers can only sell what they raise on their farms or make from scratch. The vendors must be within a 125-mile radius of Fairfax County. Customers are encouraged to keep their pets at home, except for service animals.